This entry was posted in Faculty, Research and tagged College of Sciences and Mathematics on May 22, 2014 by Wire Eagle. AUBURN UNIVERSITY – Auburn University scientists have made a discovery that shakes the very foundation of the evolutionary study of the animal kingdom. 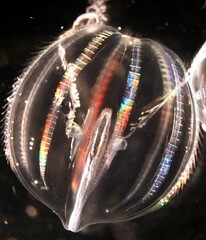 Halanych and the team of scientists, including Kevin Kocot, postdoctoral scholar in the Department of Biological Sciences at Auburn, along with an international team of scientists led by Leonid Moroz, Distinguished Professor in the Department of Neuroscience at the University of Florida, have studied the complete genome of a comb jelly, Pleurobrachia bachei, known as the “Pacific sea gooseberry.” They were able to show that the species is remarkably distinct from other animals in that the genetic mechanisms used in ctenophore nerves and muscles are different from those seen in other animals. Halanych said the discovery that ctenophores form the base of the animal kingdom lineage, and that nervous and muscular systems may have evolved at least twice, implies that the earliest animals on earth may have been more complex than previously thought. For more information on Halanych, the Stewart W. Schneller Endowed Chair in the College of Sciences and Mathematics at Auburn, visit his website at this link: http://www.auburn.edu/academic/cosam/faculty/biology/halanych/.